The mythic figure of Orpheus – who moved men, beasts, woods, and rocks with the music of his lyre – is considered the patron saint of all musicians. When Claudio Monteverdi wrote his opera “L’Orfeo: in 1607, he introduced a completely new style of music which influenced generations of composers after him. La Gente D’Orfeo (The People of Orpheus) was formed in 2001 to play the chamber music repertoire of 17th century Italy, the time when Monteverdi’s new style began to flourish in the works of other composers as well. La Gente has performed at the University of Michigan’s Museum of Art in connection with its exhibit “Women Who Ruled: Queens, Goddesses, Amazons 1500-1650,” and at the Detroit Institute of Arts’ Fine Arts Friday Series, and has recently collaborated with the vocal ensemble, Vox, at the DIA for the opening of the exhibit “Magnificenza! 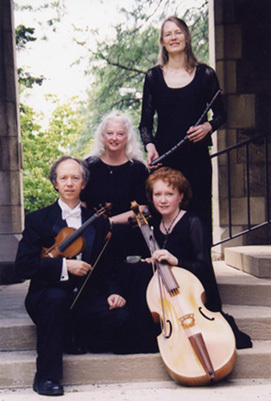 The Medici, Michelangelo, and the Art of Late Renaissance Florence,” as well as on the Academy of Early Music’s 2002-2003 concert series in Ann Arbor. La Gente’s newest program, Passion and Repose: an Early Italian Musical Extravaganza, includes sonatas by Castello, as well as works by Giovanni Battista Fontana, Giuseppe Scarani, Biagio Marini, Domenico Gabrieli, and Andrea Falconiero. Kiri Tollaksen has performed extensively throughout North America and Europe with such groups as Apollo's Fire (Cleveland), The Whole Noyse (San Francisco), The Folger Consort (Washington D.C), Piffaro (Philadelphia), Ensemble Seventeenth Century (Ann Arbor), Philharmonia Baroque Orchestra (Berkeley), Concerto Palatino (Italy), La Fenice (France), the Huelgas Ensemble (Belgium), and La Gente D'Orfeo (Ann Arbor). As a professional trumpet player, Kiri is a member of the Greater Lansing SymphonyOrchestra, plays the Eb soprano saxhorn with the Dodworth Saxhorn Band (a re-creation of a 19th century community brass band, based in Ann Arbor) and plays cornet in the River Raisin Ragtime Revue. She teaches trumpet privately and through the Ann Arbor School of Performing Arts, and has taught cornetto at the Amherst Early Music Festival in Storrs, CT. Kiri holds performing degrees in trumpet from Eastman, Yale, and a Doctorate in Musical Arts from the University of Michigan. Kiri has recorded with the Huelgas Ensemble, Apollo's Fire, and Piffaro. Daniel Foster has taught violin at Eastern Michigan University, Ypsilanti, Michigan, since 1987. He holds degrees in violin performance from the University of Illinois and the University of Michigan. Since 1978, he has appeared frequently throughout the United States as a solo and chamber artist, with repertoire ranging from the seventeenth through the twentieth century. He is a founding member of the Red-Hot Lava Chamber Ensemble based in Honolulu, and is a member of the Alexander Trio, faculty piano trio at the Eastern Michigan University. As a Baroque violinist and violist, he has performed and recorded with Ars Musica Baroque Orchestra, Smithsonian Chamber Players, Oriana, and Tafelmusik, and is currently a member of La Gente D’Orfeo. Debra Lonergan was a long standing member of the Michigan Opera Theatre Orchestra and worked extensively with Ars Musica Baroque Orchestra, including its 1989 Michigan MozartFest and a twenty-city national tour celebrating the 1985 Bach anniversary year. Currently a member of ArborBaroque and Milwaukee Baroque, she has been invited to play basso continuo in concert for renowned Baroque specialists including violinists Jaap Schroeder and Stanley Ritchie, cellist and gambist Enid Sutherland, soprano Ellen Hargis, and harpsichordist David Schrader. Ms. Lonergan also served as an academic program administrator for the Center for Creative Studies-Institute of Music and Dance in Detroit. After receiving her degree in cello performance from Western Michigan University she made an extensive study of string pedagogy, and has taught for over 20 years, maintaining an active Ann Arbor studio today. She plays an English cello in its original condition from the Walmsley School, ca. 1780. Martha Folts' keyboard repertoire covers a wide range of styles. Beginning her performing career as an exponent of avant garde organ music, she performed recitals at colleges and universities throughout the U.S. and at conventions for the American Guild of Organists including the National Convention in Boston, 1976. In addition she performed at 20th century music festivals in Sinzig, Germany, Toulouse, France, and Aarhus, Denmark. Returning in recent years to keyboard repertoire of the 16th - 18th centuries, Martha Folts has presented recitals and workshops throughout the midwest including Susquehana University, Selinsgrove, PA, John Carroll University, Cleveland, OH, Kenyon College, Gambier, OH, Ripon College, Ripon, WI, Augustana College, Rock Island, IL. An Iowa tour included concerts at Iowa State University, Ames, Central College, Pella, IA, Drake University, Des Moines, IA, and the University of Iowa, Iowa City. Additional recitals include the Lincoln Organ Showcase Series, Nebraska, and the Region VI convention of the American Guild of Organists where she gave harpsichord recitals on historic instruments at the Shrine to Music Museum in Vermillion, SD. Ms. Folts joined two colleagues in performances of J.S. Bach’s concertos for multiple harpsichords (BWV 1061,1063 and 1064) in a concert at Eastern Michigan University for the Region V Convention of the American Guild of Organists in June, 1999. As a member of the Midwest Historical Keyboard Society she has given lecture-recitals on Italian keyboard music and participated in performances of Bach’s Well-Tempered Clavier. Martha Folts has taught on the faculties of Iowa state University in Ames and Miami University in Oxford, Ohio. Moving to Michigan she completed the Doctor of Musical Arts Degree in harpsichord performance at the University of Michigan in April, 2000, studying with Edward Parmentier. Martha Folts has recorded for the Delos and Musical Heritage Society labels, and her recorded performances on both organ and harpsichord have been broadcast on WGUC-FM in Cincinnati and over Minnesota Public Radio. She also serves as vice president of the Midwest Historical Keyboard Society. Dr. Folts presently teaches at Adrian College, Adrian, Michigan, is a member of the ensemble “La Gente d’Orfeo”, specializing in the performance of 17th-century Italian repertoire. She serves as Minister of Music at St. Paul United Church of Christ in Chelsea, MI where she resides with her husband, Stephen.